EDMONTON, AB, June 7, 2017 – For most of the past three decades, it was known as Kingsway Toyota – renowned in Edmonton as a proud supporter of its local community and provider of outstanding service for its customers. 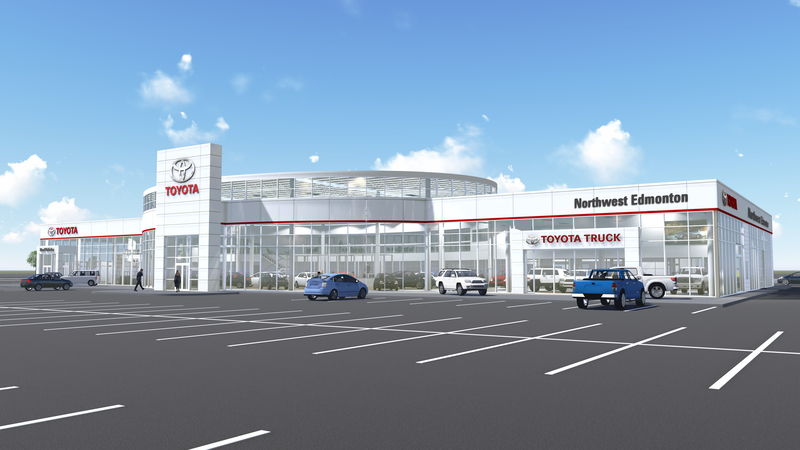 Now the dealership opens an exciting new chapter in its history, with not only a new name – Toyota Northwest Edmonton – but an exceptional new 97,500-square-foot, state-of-the-art facility. Last night, Toyota Northwest Edmonton celebrated its official grand opening with a “Kagami-Biraki” (a traditional Japanese ceremony to open sake barrels), attended by numerous dignitaries, including Toyota Canada Inc. President and CEO Larry Hutchinson. The new site – located at 14240 137 Ave. NW – features a dramatically improved service capacity, including 35 service bays, four detail bays and three drive-through service lanes, so customers will be able to get in and back on the road faster than ever. And, while waiting for the work to be done on their vehicles, they can relax at a gourmet café stocked with hot and cold food items, as well as specialty coffee and other beverages. There’s also a gaming area where kids can have fun while waiting. For those cold Alberta winters, the facility offers a large delivery centre and indoor reception for test drives. With over 450 parking stalls for customers, they can arrive indoors and never have to go outside, whether they are getting their vehicles serviced or looking to buy a new one and want to take a test drive. Among the special environmentally-friendly architectural features of the new facility, is enhanced solar-reduction glazing in the showroom, which reduces energy consumption by reducing the need for air conditioning in the summer. LED lighting and sensors also reduce the amount of power that’s consumed. And the exhaust system in the vehicle area is variable speed, so it can match demand. The dealership’s strong support for charitable causes – which to date has exceeded $2 million – will continue as strongly as ever at the new location. Among the beneficiaries of Toyota Northwest Edmonton’s generosity are the YES Foundation, Children’s Autism Society and Boyle Street charities in Edmonton, as well as the Sturgeon Valley Hospital Foundation in St. Albert. The dealership also hosts special Family Day and Halloween Hunt events each year in St. Albert, and contributions are made to help Free the Children’s important work in Africa.